New Tech. Printers is a leading printing house which is established in this business for the past 30 years -Engaged in Branding, Designing, Offset, and Digital Printing. We began with small steps in the print industry with interests in paper sourcing and print jobs, During those days industrial capacity grew exponentially in every category of manufacturing and print production was very much part of this expansion. Our printing press in Nalagahar has come to be known as a expert in printing and we focus on qualith and timely delivery. 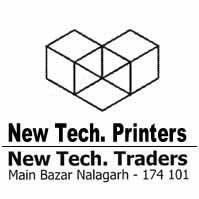 we are presently catering to a major bulk of printing business in chandigarh making us one of the top players. QUALITY POLICY : At our Printing press, we give priority to mainly two things, above all else. First is on the quality of products we create & the second is customer satisfaction. To keep up the good work we consistently innovate to improve the quality of our services. The Quality Policy allows us to get customer satisfaction , timely delivery and good will which is getting us more and more work. New Tech. Printers is engaged in designing & printing of all printing material like - Visual Aids, Visiting Cards, Envelopes, Letterheads, Leaflets, Flyers, Posters, Newsletters, Magazines, Brochures, Catalogues, Books, Coffee Table Books, Journals to name a few.